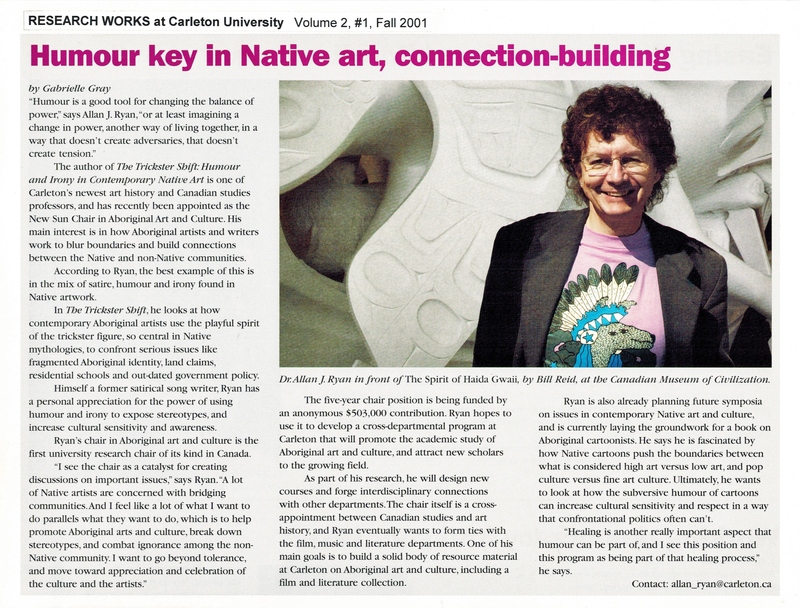 OTTAWA, January 26, 2001 – After a national search, Carleton University has announced the appointment of an innovative scholar as the New Sun Chair—the first university research chair in Canada to specialize in Aboriginal art and culture. Natalie Luckyj, Director of Carleton University’s School of Canadian Studies, says Allan J. Ryan’s appointment brings a wealth of experience in the area of aboriginal art and culture, and international acclaim for his scholarship. Colleen Cutschall, an Oglala-Sicango-Lakota artist, a professor and Visual Arts Co-ordinator at Brandon University, and past president of the Native American Art Studies Association, calls the appointment “just wonderful. Allan is an outstanding researcher and an entertaining lecturer whose papers and lectures have always been well received. He has welcomed Aboriginal people into his life, and is both supportive and sensitive to the issues,” says Cutschall. The Chair was made possible by an anonymous contribution of $503,000 through the Community Foundation of Ottawa.